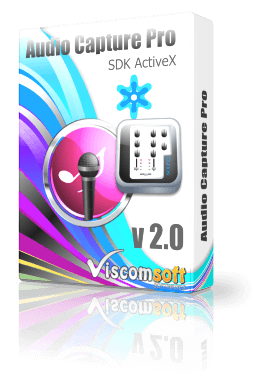 For Windows Developers who need to audio capture, record from audio input pin and add audio mixing specific audio device with specific speaker features. Audio mixing specific audio device with specific Speaker at same time (include support Window 7 , Window 8 and vista). In Window 7, Window 8 and vista, support enumerate and select all available Speaker. Capture audio to sample grabber. 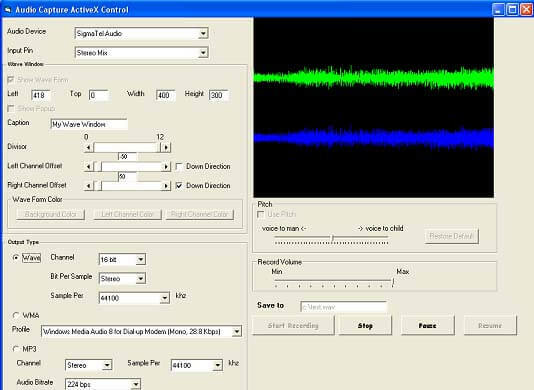 Customizable the waveform allow you to change the background color, left/right channel\'s waveform color, offset, divisor of waveform. Include c# 2010, c# 2005, VB.Net 2010, VB.Net, VFP, VB , VC , Delphi Sample source code. added audio mixing specific audio device with specific Speaker at same time (include support Window 7, Window 8 and vista). fixed sync issue when display waveform. improved more stable on vb.net and c# application. added AudioMixAudioDevice2InputPin, AudioMixSelectedSpeaker, AudioMixWithSpeaker properties. added GetAudioDeviceCount, GetAudioDeviceName, GetAudioInputPinCount, GetAudioInputPinName, GetWMVProfileCount, GetWMVProfileName methods. updated vb6, vb.net 2010 and c# 2010, vc , delphi samples.